The Visual StyleBuilder tool offers the option to modify an already existing skin by uploading an archive with the proper structure. This can be one of the built-in skins or a custom skin. The format of the archive must match the structure the StyleBuilder expects. This is the structure a skin has in the installation folder of the Telerik® UI for ASP.NET AJAX. After you create the custom skin you will need to register it on the page where it will be used. For instance, if you need to alter the Black skin of the RadGrid Control you will need to go to [Telerik® UI for ASP.NET AJAX installation folder] [your version of the controls here]\Skins\Black, get the folder containing the images needed for the control (named Grid in this example) and the stylesheet applied for the black skin - Grid.Black.css file – and archive them into a single file (for example this could be Black.zip). Some of the Telerik controls are composite controls and use other controls from the suite internally. These additional controls must also be included in the archive with the main one. You can see a list with the required minimum by trying to create a new skin in the StyleBuilder and selecting only the desired control. Here follows an example how several controls that are used together should look like when archived. Having more than one control does not change the structure of the archive, the needed files and folders are merely added. This allows for skinning several controls at a time. Make sure that the files inside have no custom permissions and attributes - i.e. they should not be read-only, access to them should not be explicitly limited to given users on the local machine, etc. Having files that cannot be accessed or modified means the Visual StyleBuilder cannot work with them and cannot generate the new archive. To get the needed files for one of the built-in skins you can go to [Telerik® UI for ASP.NET AJAX installation folder] [your version of the controls]\Skinswhere you can find all of the skins of the controls with the default installation of the Telerik controls)so you can choose the skin whose styles you need to alter.You can also use a custom skin that has already been implemented. 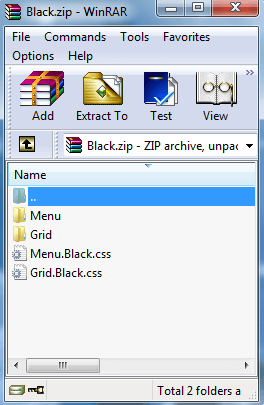 Choose the Import and Edit Skin option form the first page inVisual Style Builder and choose to the folder containing the skin (Black.zip for this example) file. The Visual Style Builder is designed in a way to automatically detect the control whose skin you are editing.Thus, it will display the controls whose skin you imported in step two on the left hand side of the screen. Proceed to edit the existing styles as described in the Fine Tuning section. After saving the changes, you can get the altered skin by using the Download button. The next steps would be to extract the file and use the custom skin your project.